For over three decades, the bridge has experienced significant levels of corrosion mainly caused by natural elements. 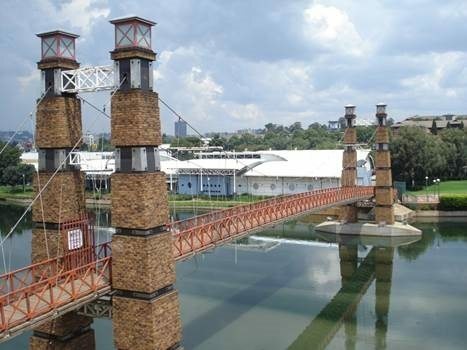 Boksan Projects in partnership with Basil Read & ARQ Consulting as the main contractor have embarked on a plan to give the Bruma Lake Bridge the much needed facelift as part of the bigger plan to rehabilitate the Bruma Lake Business precinct. Boksan has also incorporated Prokon Software Consultants as their chief advisers and Autodesk reseller. The initial challenge experienced so far is how to maintain the initial architectural design of the structure so as to trim down on costs. “The challenge was to make use of existing structural elements as much as possible to manage project costing,” says Wayne Page, a structural detailer at Boksán. “It’s therefore important to maintain the original structure of the bridge, which is a cambered profile suspended from steel cables with balustrades that have a unique design, rolled-profiled hand-railing and shaped stanchions. Another perennial challenge with refurbishment of old building structures is how to trace their original architectural designs that most times are paper-based hand-drawings and therefore hard to preserve over a long period of time. Contractors therefore need to recreate the whole drawing afresh before they carry out any repair work needed. Detailed drawings are important to the success of any construction project as they ensure the project conform to accuracy, as well as make it easy to arrange for other logistical aspects such as transportation and lifting the structure. Bridge detailing is particularly challenging for architects because each bridge is unique. Boksan managed to overcome this challenge thanks to a technology provided by the Advance Steel 2015 package from AutoCAD platform. This software helps to speed up design, steel detailing, fabrication and construction. It enhances accuracy, reduces fabrication time and enables more uninterrupted workflow. Prokon Software Consultants also provided Boksan with all the necessary information required on how to use the Autodesk Advance Steel. Autodesk makes it easier to model the existing bridge structure with minimal complication. The bridge skeleton will be assembled offsite in a factory in Olifantsfontein so as to reduce onsite mistakes then transported to the building site. The project is scheduled for completion by end of April 2016.